When it comes to mobility training, the hips and shoulders are often primary areas of focus. There’s good reason for that: they are the only ball-and-socket joints in the body, and thus are primed for mobility by design. So when our hips are not moving well, it should be cause for concern. For most of us, the ability to adequately use our hips leaves a lot left to be desired, and unfortunately a lack of adequate movement in the hip joint can be a precursor to lower back pain, knee pain, and increased susceptibility to injury, particularly during athletic endeavors. In order to most effectively improve and maintain mobility in our hips, we need to understand some basic hip anatomy, some of the potential reasons our hips tend to lose mobility, and then have some tools in our back pocket to be able to directly address what is causing our lack of hip mobility. I am of the opinion that mobility training has become way too complicated over the years, particularly with the age of social media. You don’t need hundreds of different exercises to improve hip function. More important than having hundreds of tools to address immobile hips is the skillful and appropriate application of these tools based on thorough understanding. It’s not the tool, it’s effectively you can use that tool. The purpose of today’s article is to breakdown some of the primary factors that affect the mobility of our hips, whether structural, functional, or otherwise, and ultimately how to effectively improve and maintain the health of our hips through a combination of exercises, drills, and training protocols. The hip joint is made up of two primary articulating structures, the acetabulum (socket) and the head of the femur (ball). The acetabulum is a conglomerate of the bones of the pelvis: the ilium, ischium, and pubis. Depending on how our bones develop over our lifetime (combination of genetics and lifestyle), the anatomy of our hip sockets can vary from person. Some peoples’ hip sockets are shallow while others’ are deeper. Some face more forward while others might be positioned more laterally. In addition to having individual variation between people in regards to hip socket anatomy, we also see a ton of variation between individuals in regards to the head (ball) and neck of the femur. See the pictures below to get a better visual of all of these potential anatomical variations within the hips. The shallowness or depth of the acetabulum leaves more or less room for movement in the hip. Notice how the different angles of the neck of the femur can affect force transmission through the pelvis. Notice the variation between femurs: length, torsion, neck angle, size of the femoral head, etc. We can clearly see that structure alone can have a huge impact on the movement capacity of our hips. Some of us naturally have better mobility in our hips than others. Some of us are better suited to squat deeply than others. Some of us might be more suited for deadlifting. Some might prefer a narrower stance while others might benefit more from a wider stance. Some of us need to work diligently and regularly on mobility in order to maintain it, while some have naturally mobile joints. Utilizing a combination of passive and active mobility screens, as well as a myriad of different exercises and drills can help to provide an idea of what is most affecting our hip function, whether positively or negatively. There are two primary ways to categorize mobility in the context of an assessment. Passive mobility is range of motion assessed manually by the therapist, where the client is completely relaxed. Active mobility is assessed by asking the client to move through specified ranges of motion via their own voluntary muscular effort. There is almost always a discrepancy between the two. Just because the joints have structural capacity for range of motion does not inherently mean that we also have the muscular control and strength to effectively utilize that range of motion. Passive mobility gives the therapist or practitioner a lot of information about whether or not the immobility is coming from structural or tissue limitations. If I take someone’s hip through passive range of motion assessments, I can feel if the ligaments, tendons, capsule, or bone on bone contact is what is creating the limitation in mobility, or if it feels like guarding and protective muscular tension is more likely the culprit. Active mobility gives the therapist or practitioner information about how the client is able to create motion in the hips via their own ability to control muscular output. Structure does not always dictate function. While hardware can be physically manipulated to potentially improve mobility, neurological outputs are not as easy to manipulate to create predictable change. Motor control is the key to active mobility and owning your range of motion, and motor control can be compromised for any number of complex reasons. This is where deeper assessment skills are helpful. In addition to assessing the hip joint directly, we also need to take into account how other areas of the body can potentially be affecting the hip. Often times a restriction in the hip, like any other joint, is simply a compensatory response to dysfunction (usually instability) somewhere else. 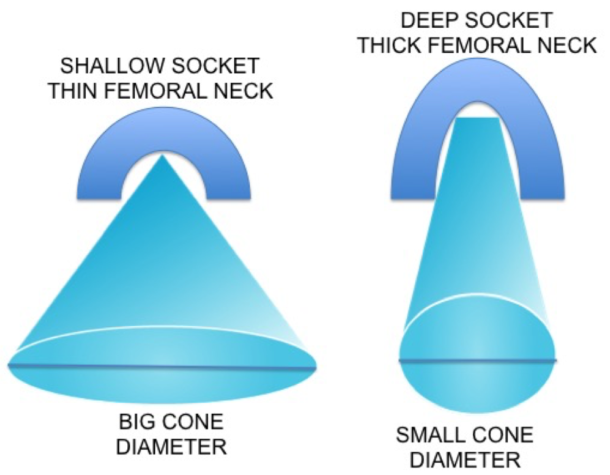 Typically, the core/pelvis and the ankle/foot all play large roles in hip function. If we go back to the question I posed earlier, whether hip mobility is coming from a structural/anatomical limitation or if it is simply compensation for lack of stability elsewhere, giving the above protocol a shot might help illuminate this for you. Hip mobility is a direct product of how stable your pelvis is, and how well your feet can provide your hips feedback during closed chain movements. The chances are high that your hips will move well and maintain good mobility if you have the requisite core/pelvic stability, functional and strong feet, and train your hips through various ranges of motion regularly. Once you’ve got an idea of whether your hip dysfunction is mostly coming from lack of actual joint mobility, imbalanced muscular tension, or from a weak link somewhere else in the body, there are no shortage of hip mobility drills, programs, progressions, and sequences you can utilize to start restoring the mobility in your hips. With a better understanding of what our hip mobility can be affected by, it’s time to put that knowledge to good use and start the process of improving and maintaining functional and mobile hips for the long-haul. Since there are literally hundreds if not thousands of potentially helpful exercises to improve hip mobility, rather than overwhelm you, I want to share just a few of my favorite go-to drills that I have used to great effect in helping restore clients’ hip function. First, it is a good idea to have a movement that teaches the functional relationship between the lumbo-pelvic complex and the hip. As we’ve already shown, an unstable pelvis will almost always lock up the hip joint. I have three favorites to address this issue: Deadbugs, Birddogs, and Quadruped Rocking. Each of these exercises puts particular emphasis on maintaining isometric stability (preventing movement) through the lumbar area. We are relying on our hip flexors controlling the hip joint. Focus on feeling the motion exclusively through the hip joint. Adjust the difficulty by shortening the leg by flexing or extending the knee. Make sure you don’t need to hold your breath to accomplish pelvic stability. This movement is essentially an inverted deadbug. We are relying on our hip extensors controlling the hip joint. Without feedback from the floor, the lower back is more susceptible to unwanted movement. Try and minimize the shifting of your weight side to side; stay centered. Great regression of the squat pattern. The goal is to learn how to brace the core while accessing end-range closed-chain hip flexion. 4 points of contact with the floor allows for good amount of tactile feedback. If you can do these perfectly, but can’t squat standing, then your feet are likely the issue, not your core. After we ensure we are able to differentiate between lumbar movement and hip movement, the next step is to start working on drills that are helpful for teaching us to feel the connection between our feet and our hips. In order to do that, we need to focus mostly on closed-chain (feet in contact with the floor) exercises. Combines rotational stability of the lumbo-pelvic complex with multiplanar motion through the hip. Focus should be on maintaining a neutrally grounded foot position throughout. These are a great regression for the single-leg RDL. Rotational resistance also provides tactile feedback to help orient and integrate rotation through the ankle/foot, knee, hip, and lumbo-pelvic complex. This should feel really stable and fluid before attempting to load a single-leg RDL pattern. This is a helpful drill to integrate the hip, knee, and foot together through all three planes of motion. The goal is to minimize rotation through the spine, and promote most of the rotation through the hip. The foot should be springy; don’t allow excessive unwanted movement, but don’t let the foot go rigid. Hip mobility is an interesting topic. While there is no shortage of other considerations, exercises, and theorizing we could talk about in regards to hip mobility, I like keeping things simple. If your hip mobility is less than adequate, consider not only the tissues in the hip itself, but also the stability of the core and pelvis, as well as the functionality and loading capacity of the feet. If you are clicking on all cylinders as far as those things are concerned, your immobility hips will be a thing of the past.